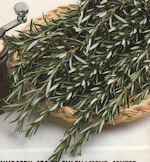 Rosemary herb is a shrubby perennial evergreen with aromatic leaves. It provides delightful seasoning for both savory and sweet foods. It can be used to flavor chicken, stew, egg dishes, pickles, shellfish, lamb, vegetables, jellies, fruit jams, cookies, and breads. You can successfully grow this warm-weather herb indoors in a container. The seeds should germinate in 14-28 days and mature in 85 days or you can do it the quick way and use a transplant. Starting by seeds: You can buy prepackaged herb kits with everything you need to start by seed. Sow seeds shallowly (1/4" deep) in a well-drained growing mix in small pots or starter trays. 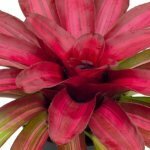 Keep plants in moist clean soil and place in a warm, well-lit area of the kitchen. Watering: Water by thoroughly drenching plants, let water drain out and empty. Do not leave plants standing in water because this will cause the roots to rot and your plant will die. Let soil dry out between watering. Containers: Terra-cotta pots are ideal for this herb because they are porous which allow plants to breathe through the sides. This protects the plant from over-watering so they dry out a lot faster. Be sure to soak them in water before the first use. 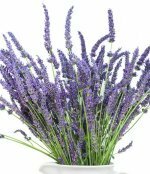 They are best for growing herbs that like dry light soil. Harvesting: Leaves, stems, and flowers can be used; however, flavor is best before plant blooms. Pick leaves and stems as need and use fresh. Mix clean chopped leaves with light vegetable, canola or grapeseed oil and fill ice cube trays two-thirds full with mixture and freeze. Store frozen cubes in freezer-safe bags. Frozen rosemary will retain flavor up to one year.